On arrival at Kilimanjaro Int. Airport, you will be met by the African Collection operational partner, Twiga Tours, and transferred to your hotel at nearby Lake Dukuti. You may wish to spend the balance of the day resting up in order to overcome any jet-lag. 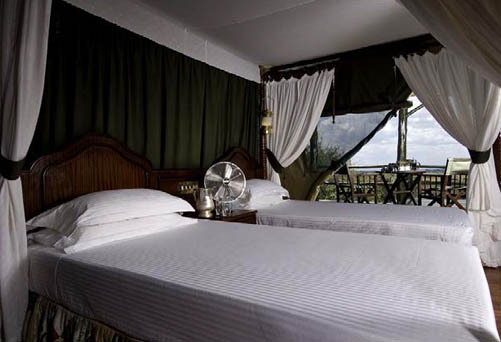 Nestled at the foot of the wooded slopes of Mount Meru, this unique hotel in stands amid coffee plantations on the shores of tranquil Lake Duluti. Designed to echo the traditional style of the colonial coffee farm, which originally stood on this site, Lake Duluti Serena Hotel offers a range of tastefully presented cottage-styled rooms set amid extensive landscaped grounds. After breakfast, you will be transferred to Arusha Airport for your 30 minute charter flight (departing 1.00pm) to Lake Manyara airport. 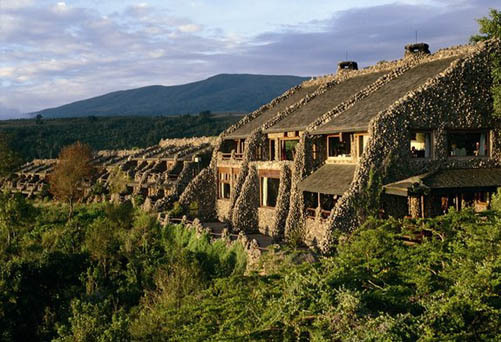 You will be met by the guide and lodge staff and transferred through the Ngorongoro Conservation Park by road to the Ngorongoro Serena Lodge on the rim of the crater. This afternoon we relax and from our lodge enjoy the breath-taking spectacular views around you. 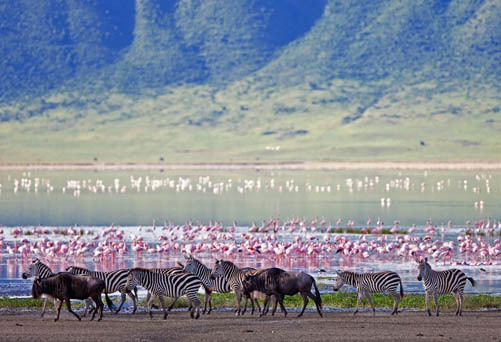 Ngorongoro Crater, often called Africa`s Garden of Eden, has the largest unbroken caldera in the world. It is one of the great natural wonders of the world. Eight million years ago, the Ngorongoro Crater was an active volcano but its cone collapsed, forming the crater that is 610 meters deep, 20 kilometres in diameter, and covers an area of 311 sq. km. Spectacular as it is, the crater accounts for just a tenth of the Ngorongoro Conservation Area. The crater is home to many species of wild game and birds. With the exception of impala and topi (due to fierce competition with the wildebeest) and the giraffe (because there is not much to eat at tree level), almost every species of African plains mammal lives in the crater, including the endangered black rhino, and the densest population of predators in Africa. The birdlife, which includes the flamingo, is mainly seasonal, and is also affected by the ratio of soda to fresh water in Lake Magadi on the crater floor. Dinner and overnight at crater lodge. NOTE: A warm jacket/cardigan is highly recommended. Your game drive today will be like no other as you visit one of the most dramatic safari destinations in Africa, the Ngorongoro Crater. Descend to the crater floor in search of the big 5 dangerous animals, with the back drop of the forest covered crater walls surrounding you. This will create creating stunning back drops for all of your wildlife photographs. Travel through the beautiful Lerai Forest looking for leopard, and onto the plains where the wildebeest and zebra graze whilst cheetah and lion lay and watch. Large flocks of flamingos inhabit the lakes. Old elephants pass your vehicle whilst further afield rhino wander and hippos hide in the pools. A picnic lunch is provided so you can maximize your day in the crater. Enjoy breakfast, and then depart by road for the Serengeti National Park with a brief stop at the Olduvai Gorge, one of the most important prehistoric sites in the world to learn about human evolution. We will enjoy an on-site talk on the interpretation of the gorge by the resident guide before continuing on to the Serengeti, one the very best game parks in Tanzania. Enjoy en-route game viewing as you drive to the lodge. One of the world’s last great wildlife refuges, the Serengeti, stretches between the Ngorongoro Highlands and Lake Victoria. 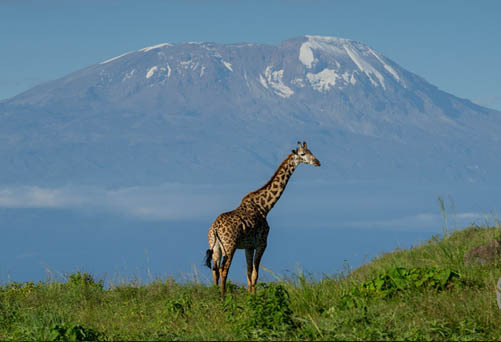 The name comes from the Maasai word siringet, meaning “endless plains”. The Serengeti’s 14,763 square kms contains about three million large animals, many of them taking part in seasonal migrations, unparalleled in nature. The rolling plains and grasslands, stretching far into the horizon as far as the eye can see, is home to the awe inspiring black-maned lion, the savannah elephant, the Cape buffalo, wildebeest, the elusive leopard, cheetah, the spotted & stripped hyena, rhino, topi, burchelle’s zebra, the Maasai giraffe among many others. At Serengeti National Park visitors are spoilt for choice with the huge variety of bird and wildlife species in this game reserve. After breakfast, we drive slowly across the central Serengeti to the Western Corridor. The Western Serengeti’s star attraction is the Grumeti River, that winds through the area, filled with hippos and huge crocodiles. 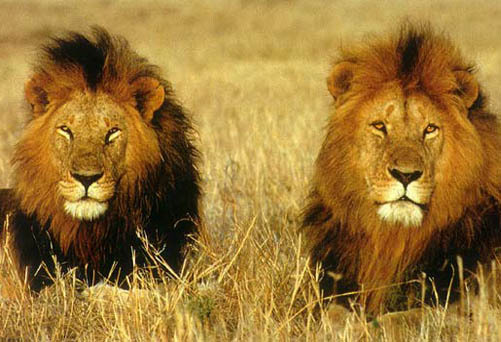 You will have the chance to see lion, leopard, cheetah, elephant, and herds of topi and bat eared fox. The most exclusive of the Serena Group’s many safari venues, and a member of the Small Luxury Hotels of the World group, Kirawira Tented Camp offers the epitome of a classic ‘Out of Africa’ safari camp luxury. Styled to replicate the elegant hunting camps of such legendary ‘white hunters’ as Denys Finch Hatton and Baron Bror Blixen, it is located adjacent to the famous western corridor of the Serengeti National Park — arena of the ‘Greatest Wildlife Show on Earth’, the annual migration of over one million wildebeest. An early morning game drive to view the huge migratory herds. 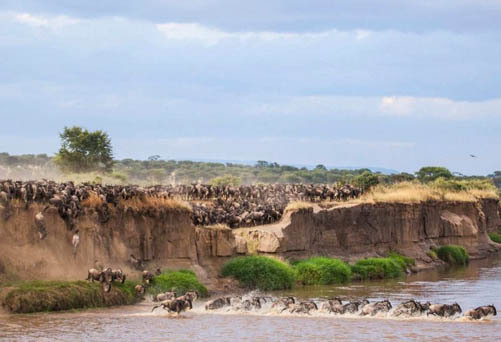 Although the timing and extent of the great migration can be variable according to rainfall and vegetation patterns, it is very likely that in May month the herds will have reached the Western Serengeti corridor. You may even be lucky enough to observe the incredible spectacle of a migratory river crossing, with crocodiles in attendance. If you would like to maximize your day with these experiences, a picnic lunch will be on hand to allow you to stay out and return to the camp in the late afternoon. Enjoy this last day in the mighty Serengeti – you will definitely remember it for the rest of your life ! An early breakfast is necessary before a transfer to the nearby Grumeti air strip, for your flight to Kilimanjaro International Airport (approx. 2 hours). Depart Kiliminjaro International Airport on a scheduled flight to your next destination.